Review: It is the morning of 9th September 2014, Mary Mapes veteran CBS News Producer believed that she had every reason to feel proud of a broadcast journalism job well done. This is investigating then-president George W. Bush’s military service. At the end of the day it cost Mary Mapes and venerable CBS News anchor Dan Rather their careers over the subsequent firestorm of criticism. This is the first directorial film for James Vanderbilt. 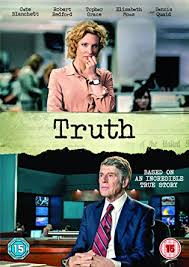 Cate Blanchett is brilliant at playing Mary Mapes but even she can’t save the film. I didn’t really think much of the script. I felt they almost didn’t know what to do with the film. I didn’t know whether they were trying to make it as a documentary or as an actual film or even both. The film has been in development since 2007. It was far too long for what it needed to be just over the 2 hours. Filmed in Australia as Cate Blanchett wanted to be near her family while filming. It is always lovely to see Robert Redford but in this he didn’t actually add anything to it.